Before I left America for Hungary, just about everyone I talked to had a cautionary tale of horror related to the Central/Eastern European medical experience. None, of course, had ever had any Central/Eastern European medical experiences, but everyone has an uncle, who has a friend who has a friend… And the friend is always missing an eye now, because of it. Even on ex-pat websites in Hungary, these socialized systems are easy to make fun of, at the expense of hard-working professionals who are sometimes on the bad side of a difficult-to-maneuver system. Ever since arriving in Hungary, I’ve had a completely opposite experience. A kind and intelligent private doctor who has given me quick access to my allergy medication and an anti-biotic for my awful strep throat last year. And just recently, a trip to a private clinic for a complete physical workup, with procedures that I would never have gotten, nor have been able to ever afford, in America. Full disclose: where I went was a private clinic. So you pay for it out of pocket, and it is not part of the free, socialized health care system. And of course no, not everyone can afford it. 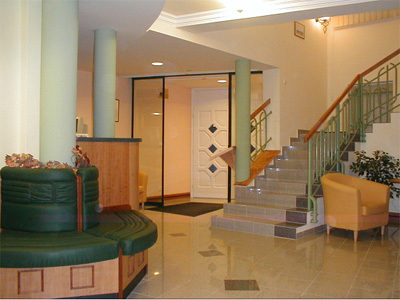 But in this lovely clinic staffed by perhaps some of the finest doctors in Hungary, the entire of the procedures (including consultations, blood work, ultra sounds, physical analyses, vaccinations, and other procedures that I’m having a hard time even remembering from that day) was around 300 dollars. I’ll wait here for a second, Internet, until you get back into your chair. Everything was arranged by the super-organizing-genius Varga Szilvi. I don’t know what Szilvi eats in the morning, or what she puts in her coffee, but I desperately need to get my hands on some of it. When we arrived in Szeged at the Medicenter, she was standing in the lobby and ready to immediately take us to the first doctor. She was smartly dressed and kind of sassy and I felt like I had my own personal attaché for my physical, even though she seemingly was helping everyone around in this way. In addition, when the day was almost over, and because I couldn’t eat for my stomach ultrasound, she went out and bought me a little spread of sweet and savory biscuits, which she put on a plate in the little lounge for me. It was the sweetest thing anyone has ever done for me at a doctor’s office. Anyway, I never personally address people on this blog, but honestly, thank you Szilvi, you made my day totally easy and manageable, and I can say that my experience at your clinic was truly the best medical care that I’ve ever received. In the morning I received two vaccinations for H1N1 and the regular flu shot. It took about five minutes and was administered by the vaccination doctor. After the vaccinations I went right downstairs to have my blood drawn by Dr. Kóczián Zsófia, who both did the drawing and analyzed it for me that day, so that when I had my other consultations in the evening, the blood work was ready. At about 10:30, I left the Medicenter building and went across town to the public clinic so that I could get chest x-rays there. And let me tell you about the HORRORS of the public, socialized public health care clinic… I waited in the waiting room for about 8 minutes, was called into the x-ray room, the nurse said two words “bra off”, the x-ray was taken, processed, and we were out of there in about 20 minutes. Yes, I see now what these Republicans (and Lieberman) want us to fear. TWENTY MINUTES. Then it was time for a little early lunch. All of my fears about the whole thing, I realized at this point, were really unfounded, and it made the rest of the day much more eye opening. I wish I had taken pictures of the doctors, but you know, after you get a pap your first instinct isn’t to whip out your camera for a candid. When I got back to Medicenter, I had another round of consultations and procedures. The first was with Dr. Halmai László who is the Cardiologist. We chatted for a little bit, he did a few exams and went over what he saw in my EKG and my blood work. Then he did an ultrasound on me to look at my heart, all the while asking me some questions about my writing life and telling me about a friend he met from America who also teaches writing. He was so friendly and knowledgeable and I really felt at ease. Then I was sent to the next room to see Dr. Vass Gábor, the ear, nose, and throat doc. We talked about a few of my allergy problems, he did a thorough exam, told me to stop using Q-tips because they’re bad for me, killed a little ear wax, and told me that my septum was a little deviated. Tennis injury! Again, like all of the doctors that I met that day, he was friendly, chatty, and knowledgeable. Back to the ultrasound room to meet with Dr. Hoffmann Csilla. I had met Dr. Hoffmann the previous week because she did a breast ultrasound on me. This day, however, she did my stomach ultrasound to check my internal organs and such. Her secondary language is French, but she spoke English quite well. I only needed Györgyi to translate one time after Dr. Hoffman said that I had sand in my kidney and I immediately thought about the big wave that knocked me down two years ago in Hilton Head. Of course what she meant was just some buildup in my kidney that I needed to wash out and prevent from becoming a kidney stone. Anyway Dr. Hoffman was awesome. She was especially calming the week before and I really appreciated it. She also told me I don’t have to give up coffee, so she’s totally rad in my book now. One last exam before my final consultation: Gyno! 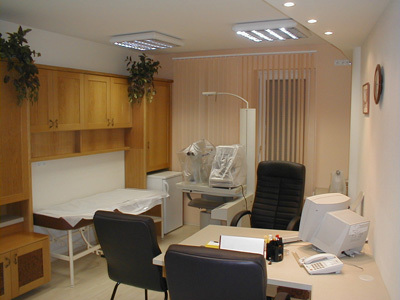 Dr. Nyirati Ildikó is the Gynecologist and she did the usual exam plus an ultrasound. She said I had nice ovaries, so I was really feeling good about myself at that point. I looked at them too, on the ultrasound. I’ve never seen the inside of my body except the pictures of my knee surgery that made me vomit. But the inside is such a wonderland, isn’t it? Anyway Dr. Nyirati was so friendly and soft spoken and gentle, which of course are fabulous traits to have as a doctor, but especially a Gynecologist. The final consultation of the day was with the surgeon Dr. Szabó István. He was the cutest thing since sliced kolacs, seriously. His job was to go over all of my results for the day, and then he did a few additional tests to check my veins and everything. He really made me feel at east and comfortable and told me practical, understandable things about health and the body and everything. The morning procedures lasted about 1 hour, including two tests and one chest x-ray at a different location. The afternoon tests, procedures, and consultations, lasted a total of about 2 ½ hours. All of the doctors were absolute experts in their fields, spoke English well, and didn’t make me feel like I was wasting their time or that they had other patients they wanted to shuffle me past to see. Some of the doctors even came in especially for these consultations, on their days off. And why? Well I can tell you one thing, it’s not because they’re making the big bucks. It does seem, however, that they actually care about taking care of people. And the nurses too, were incredibly kind. The nurses who, by the way, are going on strike this week, because they only make 90,000 HUF per month. That is insultingly low money (about 450 dollars). I’m not trying to make any political statement here or get people up in arms about the American health care system. The people who read this blog, for the most part, are like-minded people on this issue. The only ones who are significantly out of touch with reality seems to be the tea-bagging conservatives who use fear scare tactics about “Comrade” Obama’s health care system, with the reality is much different. But this post doesn’t really have to do with any of that. All it will serve as, hopefully, is a counter argument to your uncle’s friend’s friend who is missing an eye from a medical procedure in Eastern Europe. And a nagyon nagyon köszönöm szépen, for all of the doctors and staff members of Medicenter who gave me excellent medical care and treated me with respect while doing it. This was the most beautiful praise, which I received ever és nagyon-nagyon köszönöm!!!! !